Processing of the amyloid precursor protein (APP) by two different proteases, called alpha- and beta-secretase, is a central regulatory event in the generation of the amyloid beta peptide (Abeta), which has a key role in Alzheimer disease (AD) pathogenesis. 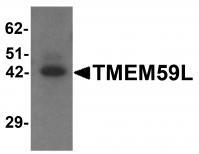 TMEM59L is a type I membrane glycoprotein that is expressed in the brain. A related protein, TMEM59, is a Golgi-localized protein that modulates the O-glycosylation and complex N-glycosylation steps occurring during the Golgi maturation of several proteins such as APP, BACE1, SEAP or PRNP and inhibits APP transport and shedding. Elson GC, de Coignac AB, Aubry JP, et al. BSMAP, a novel protein expressed specifically in the brain whose gene is localized on chromosome 19p12. Biochem. Biophys. Res. Commun. 1999; 264:55-62. 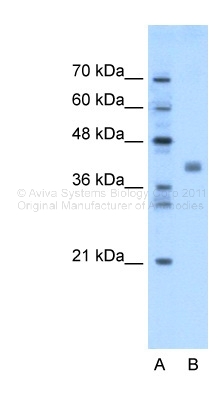 Western blot analysis of TMEM59L in rat heart tissue lysate with TMEM59L antibody at 1 ug/mL. 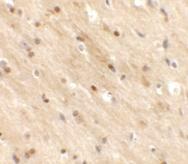 Immunohistochemistry of TMEM59L in mouse brain tissue with TMEM59L antibody at 2.5 ug/mL. 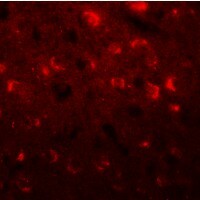 Immunofluorescence of TMEM59L in mouse brain tissue with TMEM59L antibody at 20 ug/mL.